… well, that’s just silly because if you’re a vegetarian (and not related to me), why would you be reading my blog anyway? When I started this blog, I told myself that I would not be doing restaurant reviews for a couple of reasons. One- there are a bunch of other sites that focus on that sort of thing. Two- Quite frankly, who am I to judge someone who has the guts to cook for other people for a living? So, I’m not going to review one of my new favorite restaurants, but I will talk about one of the most unique meals that I have eaten in a long time. 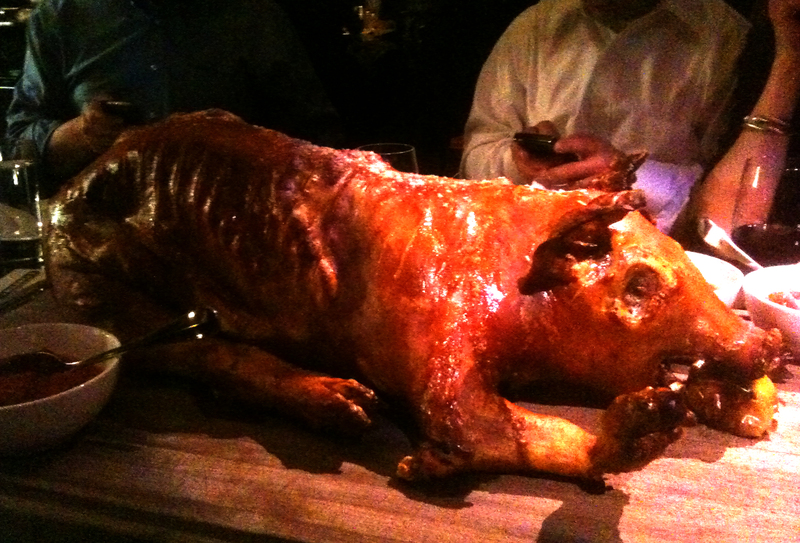 The whole roasted suckling pig meal at The Breslin. It’s quite simple. Get up to twelve of your carnivorous friends together and pay $65 each ($95 with wine parings), and you get a big ol’ suckling pig dinner seated at the “chef’s table” right outside of the kitchen. Our group of friends had no problem rounding up 10 meat-eaters. Monitoring our various social networks over the course of the day, I found out that we were all fasting in anticipation of the porcine meal. I went with the whole “vegetarian all day” approach to make sure I had enough room for the feast. When a movie that I really want to see comes out, I stay away from all of the reviews so that I can go in to it with a clear head. I took a similar approach to this meal and it was the right move. From my first bite, my taste buds were in heaven. “But, Tom” , you might say “It’s a pig roast and your taste buds are pork whores”. To that I would say “Hey! Watch your language, this is a family blog”. Then I would inform you that my first bite was not even pig related… it was Caesar Salad! Simply put, it was the BEST Caesar Salad that I had ever tasted. The lettuce was crisp, the anchovy dressing was actually tangy and light tasting, and to top it off, it was sprinkled with fried parsley. The parsley was such a great touch. It was bright green and had such an intense but simple flavor. I’m going to have to fry up some herbs some time soon. Other, non-piggy related standout eats that night were the duck fat roasted potatoes. Fry anything in fat, and it increases it’s awesomeness quotient tenfold. If said fat is of the duck variety, you are in for a treat. They were crispy on the outside and soft on the inside. Best of all, they tasted gamy. Like you were eating some unholy potato-meat hybrid. Another great side that came with the meal was the roasted fennel. It had a nice char to it and went perfectly with the intense pig flavor. Fennel is definitely going in to my arsenal when I do my next pig dish. Then came the piggy! I think the best way to describe this is to go through some of the more spectacular pieces. For those of you following my Eating Wilbur progress. You’ll see some obscure items checked off in my February recap post. Cheek- ALWAYS one of the best parts of ANY animal. It’s tender, fatty, juicy and has an intense flavor. It always amaze me that most Americans have an issue with eating any part of the head. In most cultures, it’s an honor. It doesn’t have to even be a mammal. Next time you cook a whole fish, go digging for that tiny morsel of flavor in the cheek. It will start you down the path of face eating enlightenment. 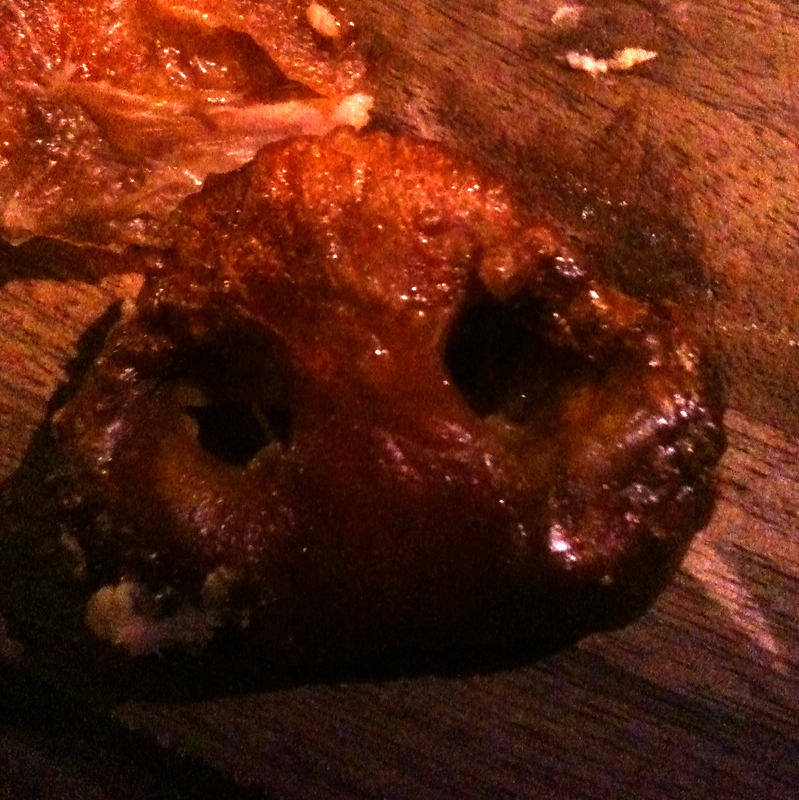 Ear / Tail/ Cracklins – The skin (or cracklins) was phenomenal. It was crunchy and had some intense pig flavor. It was like eating pig-flavored potato chips. I smelled like cracklins for the next 2 days after this meal. The ear was like a more chewy cracklin. It was OK, but I liked the little pieces of crispy skin better. The tail was more of the same- crispy pig goodness. Belly- What can be said about this? I mean this is the temple. This is where bacon comes from, for christsake! This did not disappoint. My only problem was that there wasn’t enough (everyone wants the belly… try giving them an ear and they turn up their nose, but everyone wants belly). This particular belly was tender and juicy and full of fat. Heaven. Only a Homer Simpson-esque drool/moan can do it justice. Eyes- Honestly I only ate these to knock them off of my Eating Wilbur progress chart. The waiter heard about my experiment and cut up some choice parts for me. 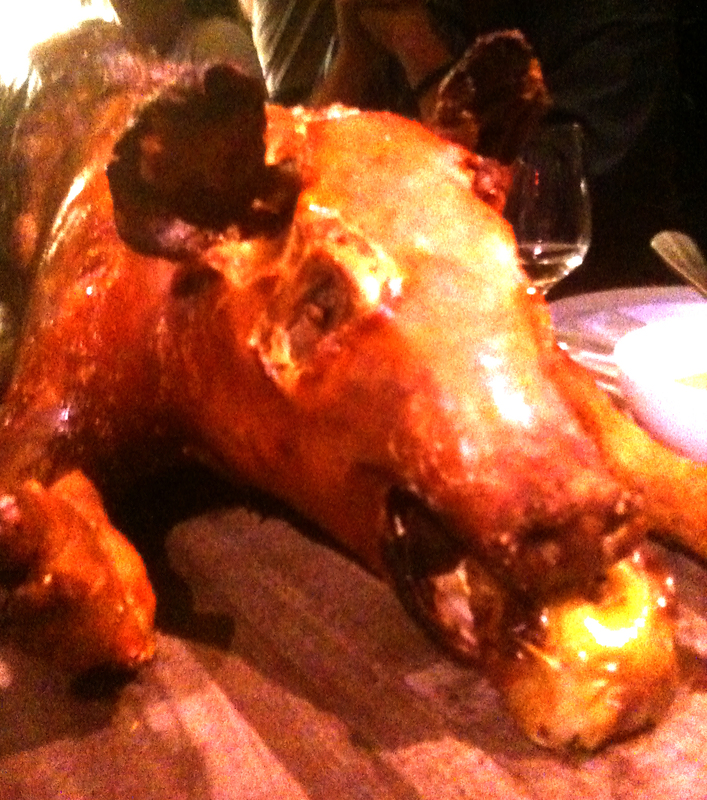 The eyes were roasted just like the rest of the pig, so they were actually crunchy and tasted a lot like the ear. Nothing really notable about them. Feet- This was the big surprise for me. There’s not too much meat on the trotter, but the tiny pieces that I did find were some of the best “dark meat” tasting pieces on the pig. They were a bit rough, but really tasty. 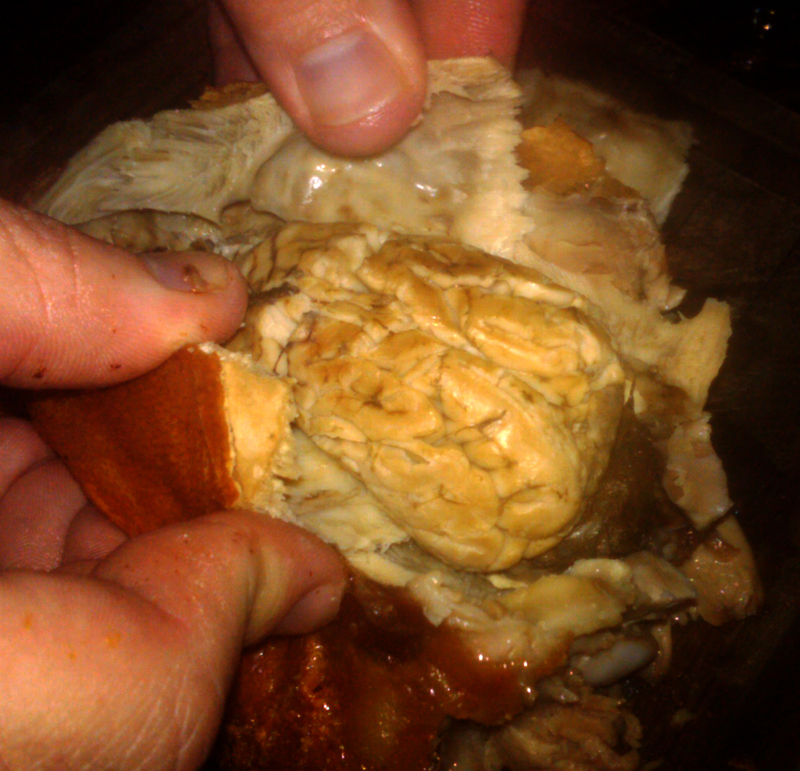 I also found out that The Breslin has a “stuffed” pigs feet item on the menu. I’m going to have to try that soon! Tongue- Another piece that I ate to simply check off of my list, but it actually was really good. It was chewy (as you’d imagine it would be), but had a mild flavor. Very interesting- but in a good way. Snout- For some reason, this grossed me out most of all (more than the next item on the list- surprisingly). I don’t know why. The waiter sliced a nice piece of this off and I was a bit freaked out. I just popped the whole thing in my mouth. To my surprise, it was actually quite good. it wasn’t as chewy as I had anticipated. It was crispy on the outside and fatty on the inside. I would definitely eat one again. BRAINS!! 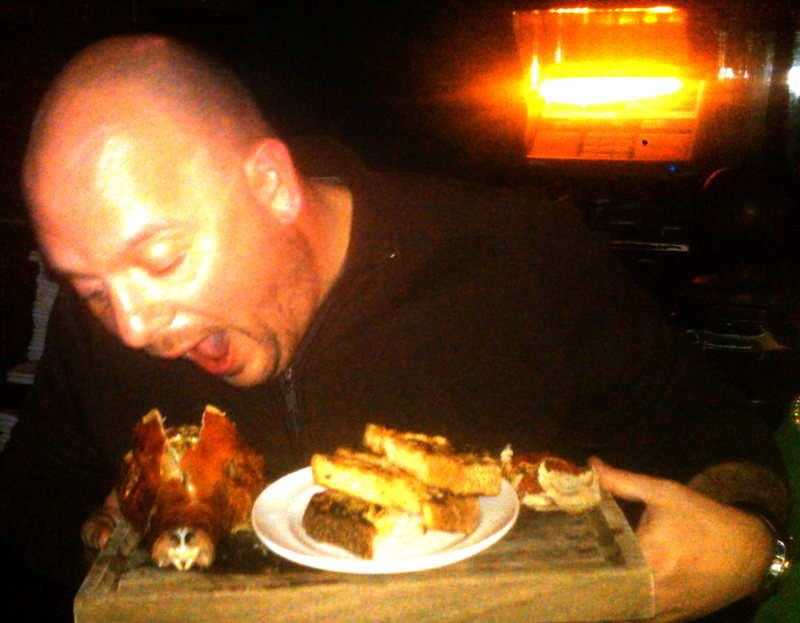 !- After the meal was over, the waiter brought out a tray of grilled roasted bread. He asked if we wanted the brain, and of course we said yes. Well, I said yes… I have no clue what anybody else was doing at this point in the meal, because after he said “brain” I became fixated on the head on the dinner table. 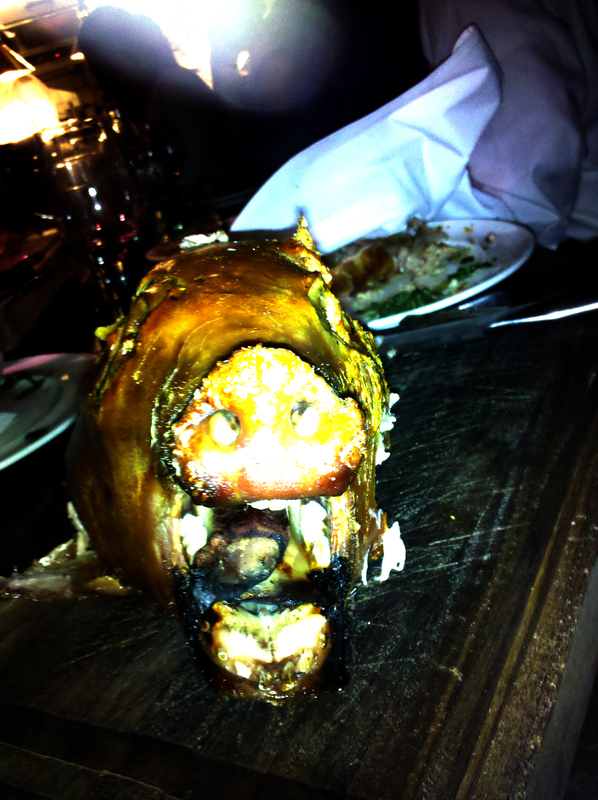 I have been to a few “whole hog” dinners in my life, but this is the first time I had a skull carved table side. I’m glad, because I would not have done it if I had to crack it open myself. The cut was perfect down the middle of the skull and the brain looked… well, like a brain. I dug in. The texture was creamy and it spread like hot butter. I now knew why the grilled bread had come out. I smeared some brain on to the bread and took a bite. It was delicate. It was mineraly. It sort of tasted like really intense sweetbreads. I kind of liked it, the taste wasn’t earthshaking, but more importantly, like a zombie in a George Romero movie, I can now say that I’ve eaten brains. I really recommend doing the suckling pig dinner at The Breslin with your carnivore friends. It was such a fun night and is totally worth it even if you just stick to the boring ol’ parts of Wilbur (like shoulder and ribs). It’s also a great way to get in to a place that doesn’t normally take reservations. If you do it, be adventurous. It’s a great way to eat parts of a pig that you will never eat anywhere else and add “ate brains” to the list of weird things that you’ve done in your life. Quite honestly… it was worth it just for that Caesar Salad.